The iconic Ghostbusters logo designed by Michael C. Gross. 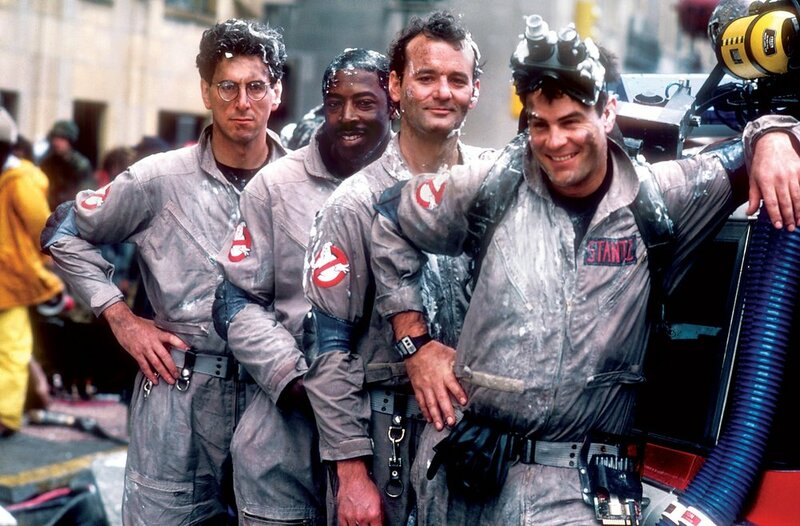 Ghostbusters was a supernatural comedy film released in 1984, and starred Dan Aykroyd, Bill Murray, Harold Ramis, and Ernie Hudson as the paranormal investigators of the movie's eponymous organization. The film also featured a talented supporting cast, with Annie Potts as the team's beleaguered-but-determined receptionist, and Rick Moranis and Sigourney Weaver as two residents of a haunted apartment building who are drawn into the supernatural conflict. From left to right: Harold Ramis, Ernie Hudson, Bill Murray, and Dan Aykroyd. The film centers around a team of investigators who stumble upon a strange resurgence of supernatural activity in New York City, and the drama surrounding those events. It was written by Dan Aykroyd and Harold Ramis. Aykroyd is no stranger to the paranormal, although he is perhaps best known for his interests in ufology. In 2005 he released Dan Aykroyd Unplugged on UFOs, in which he expressed his thoughts and opinions on the field of ufology, including his own personal experiences. Aykroyd is no stranger to ghostly phenomena, though, being the great-grandson of a seance-conducting spiritualist, and the son of the man (Peter Aykroyd) who wrote A History of Ghosts. He grew up in a house where seances were regularly conducted, and in which he still dwells. Aykroyd's family home is rumored to be haunted, and he himself has gone on record as saying there is a "mind-blowing" amount of spiritual activity present. Aykroyd's love of and comfort with the paranormal is evident throughout Ghostbusters, and the film, while a comedy, does a reasonably good job of representing paranormal investigation. It's considered a comedy classic for a reason, and one that should be happily revisited during the Halloween season.